Recently, I was given the opportunity to review the LayNGo Activity Mat Lite from the store Pish Posh Baby. 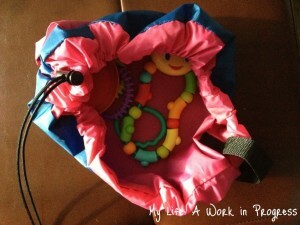 By use of a drawstring, the LayNGo activity mat converts into a bag or satchel to help carry toys on the go. It also makes toy clean up much easier, and gives kids a clean surface to play on even when out of the house. This version of the LayNGo is “lite,” since it measures 18″ compared to the 5′ full version. Since it’s made with nylon, it’s easy to wipe off when dirty or sticky from little hands. The one I reviewed is reversible with pink on one side and blue on the other, but several different colors (like green, orange, and red) are available. There’s a small pocket (closable by velcro) on each side for storing the drawstring, whether you’re using the pink or blue side. The drawstring could still be a choking hazard for small children, so I made sure to always supervise my son when the bag was out. There’s also a nylon handle to allow the bag to be easily carried. When I first received it, my initial thought was the LayNGo Lite seemed more appropriate for older children who play with Legos, K’NEX, and Polly Pocket. But I was wrong. 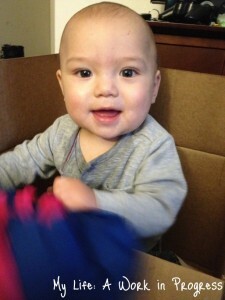 It’s very convenient to use with my 7-month old! I use it most often to haul his teethers and smaller toys with us over to a friend’s place for a play date or to the store or restaurant. 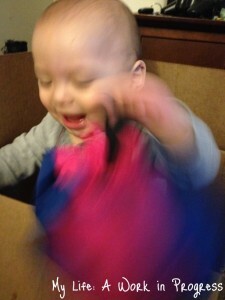 I like that it keeps his toys together in one clean, concise place, so I’m not digging for them. To me, the only negative aspect of the activity mat is the price. It retails for $24.95, which could be a drawback for families who are tight on money. I want to mention something quickly that I came across. I didn’t have the opportunity to review it, but Pish Posh Baby also has a Lay-N-Go COSMO for transporting and storing cosmetics. It’s the same idea as the activity mat, but the outside is made of quilted polyester, and the COSMO has a couple of different features. I love the idea for my makeup! It’s perfect for traveling or the every day. 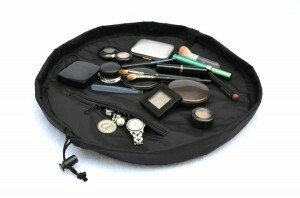 I can spread all my makeup out in front of me instead of digging around in my makeup bag, getting my fingers covered in powder. Then, it quickly wraps up with the pull of a cord. I need this! 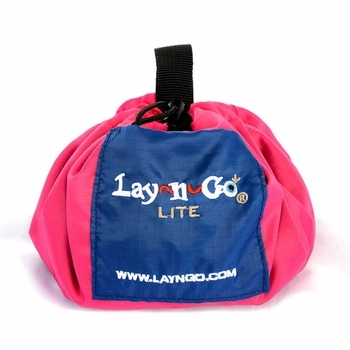 Note: I received a complimentary LayNGo Activity Mat Lite in pink to review and was not compensated for this post. I was not asked to write a positive review, and the opinions expressed above are my own and may differ from others. AWESOME!! I have a grandson comming in March and i just found out i have another grandbaby comming in June!!! I’m loving the makeup one. I have so much makeup and no where to store it. Traveling with it is a nightmare. I don’t have any children so the other one doesn’t appeal to me. It works well! I wish we could afford the 5′ one. Maybe for a Christmas or birthday present?